I started this piece while still in Michigan last fall. I took the reference photos when I visited my daughter in Moscow, Idaho! I loved the repetition of curved shapes and the splashed of pink and purple in the leaves. I put this one down several times and returned to it over and over again. I finally finished it in March of 2009. It is currently at the Art and Antiques Studio Gallery on Highland Avenue in the Eau Gallie Art District of Melbourne, Florida. It has been a very busy week. We had a great show in Vero Beach last week, which has caused me to take lots of time to paint this week to catch up my inventory for this weekend. We will be at the Melbourne Art Festival all weekend. It should be a great show, due to the fact that there are a great many talented artists in this area. If I can get them framed, I will have several of my newest pieces, including the Pink Hibiscus and the latest beach painting from my last post, which I have called Day Break. If you are in the area, please stop by my booth and say hello! Due to the work preparing for the recent shows I haven't been able to get any new online lessons prepared. I promise to have some in May, so stay tuned! 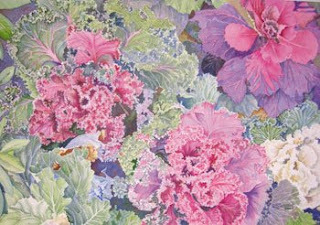 So many artists have painted kale and cabbage, but the dramatic color effects in your painting make it a standout. Good luck at your show!